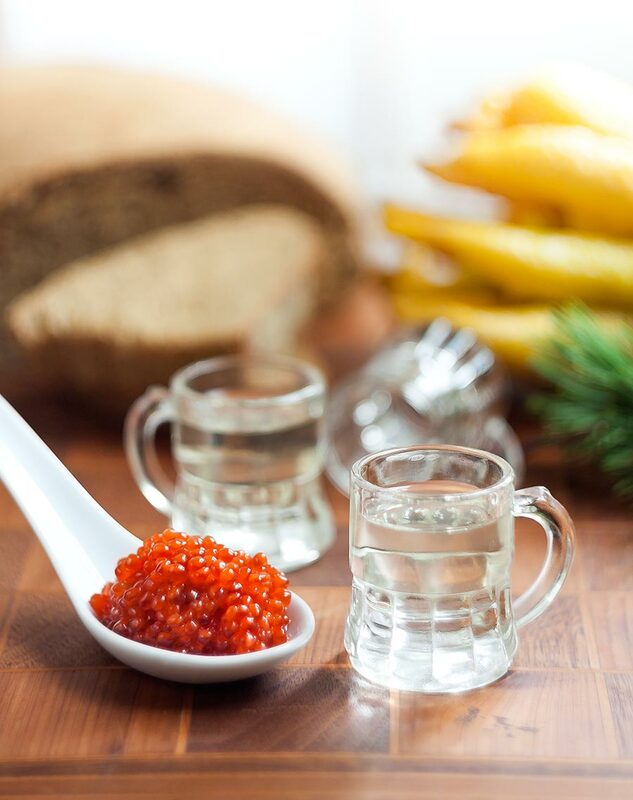 Serving caviar and vodka together is an ancient tradition in many northern European cultures. Happily for food-lovers, it’s a tradition that has successfully made the voyage across the Atlantic to North America. Caviar, of course, is made of the eggs of certain varieties of fish and has long been a traditional delicacy of many cultures. While luxurious (and expensive) sturgeon caviar is perhaps the most famous, many other varieties, such as salmon, steelhead, trout and arctic char, have become very popular – and are surprisingly affordable. What’s especially nice is that these delicious caviars are produced sustainably, so we can enjoy them to our heart’s content without fear of depleting a precious resource. One of our favorite caviars is made from the eggs of the steelhead (Oncorhynchus mykiss), an ocean-going strain of rainbow trout. Steelhead grow much larger than their landlocked cousins and consequently, their eggs are larger too. 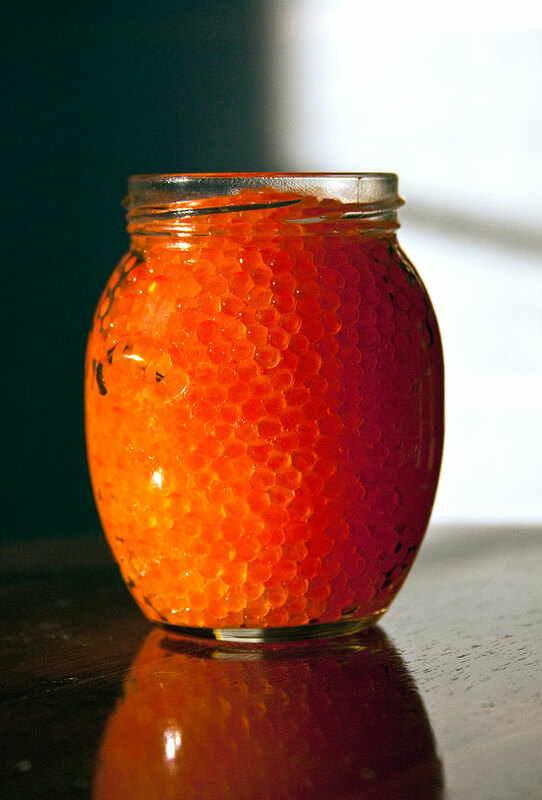 The bright orange-red eggs taste much like those of salmon, so if you’re a fan of the Japanese sushi called ikura, you’ll definitely like steelhead caviar. 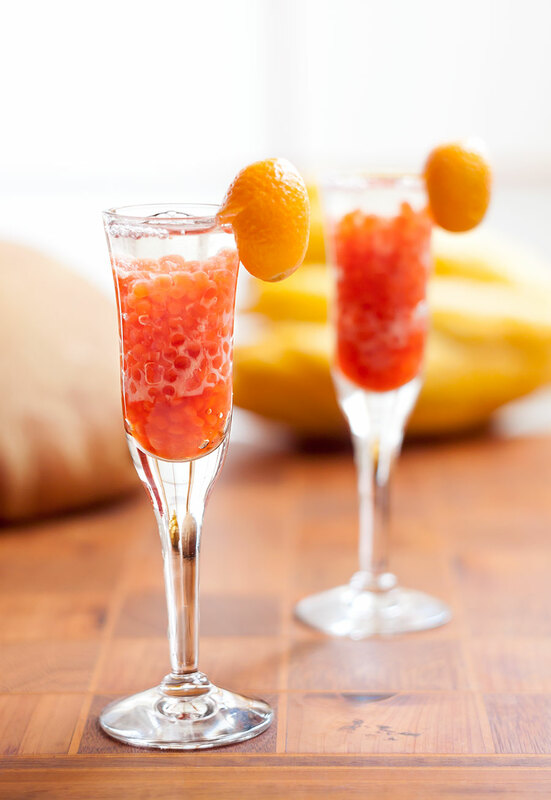 Here’s a fun way of enjoying colorful steelhead caviar with friends. Line up several shot glasses, adding a generous dollop of caviar to each one. When everyone is ready, top up the glass with a splash of Buddha’s Hand Citron-infused vodka. (Don’t let it sit for more than a second or two or the alcohol will begin to “cook” the caviar.) Raise your glass in a toast and knock it back in a single swallow. Repeat as needed. Thoroughly wash the Buddha’s Hand citron with cold water. Pat dry and set aside. Cut the Buddha’s Hand into quarters. Slice the Buddha’s Hand into 1/8th inch thick pieces. Put the sliced Buddha’s Hand into a large, sealable jar or other non-reactive container and pour the vodka over the top. If you don’t a single jar large enough to hold everything, divide the Buddha’s hand and vodka evenly between two or more containers. Seal tightly and put in a cool, dark cupboard for 7 – 10 days. After a week, taste to see how the infusion is coming along. You’ll want a delicate flavor that’s not overpowering. If it’s not ready, place the infusing vodka back into the cupboard for a few more days. 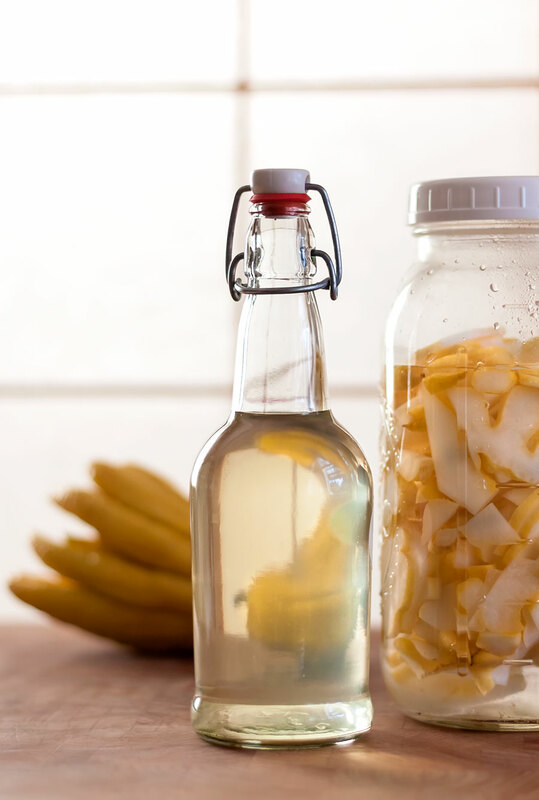 Once it’s infused to your liking, strain the vodka into bottles and cap them tightly. Reserve the Buddha’s Hand for baking or other uses (see our Buddha’s Hand & Meyer Lemon Marmalade). Before serving, chill the infused vodka in the freezer until icy cold. Serve in little shot glasses with plenty of caviar, good dark bread and creamery butter.